At 982.9 m above NN the Großer Beerberg is the highest mountain the Thuringian Forest and the highest point in Thuringia, the German state. The Fichtelberg is at 1,214.6 meters the highest peak in the German state of Saxony, about 3 hours worth of driving further south from the Großer Beerberg. 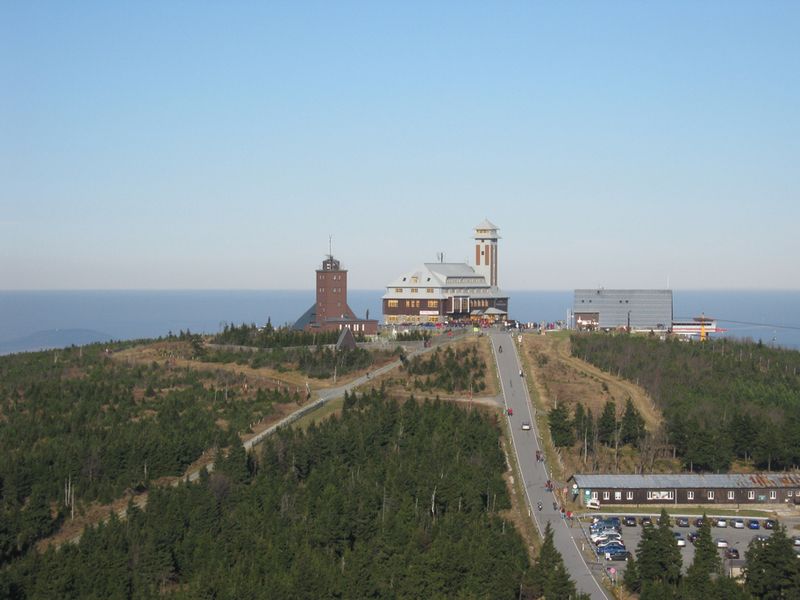 The Fichtelberg was also the highest mountain of the former German Democratic Republic. It is a mountain with two main peaks in the center of the Erzgebirge (Ore Mountains) in southern part of Saxony near the Czech border. Its shorter peak is 1,206 meters high. (East Germany). I did the Großer Beerberg first. AFter heaving left Martin's house at 6:30 in the morning, I drove about 2 hours to get to the Thuringer Wald. It turned out to be a nice day after the morning fog had cleared away. The nearest town to the summit is Suhl, which I had programmed into my GPS. I was not exactly sure, where the mountain would be located in relation to Suhl, because the city appears to be surrounded with an number of peaks of almost the same hight. I had planned to drive to the center of town and then look for a tourist information or signs. However, as I was driving in from the north, I noticed signs pointing out the Beerberg, even before I had to drop down to Suhl. I left the main highway and turned left onto a smaller but still paved road, which turned out to be a bit icy. Going slowly, I noticed signs for a hiking path, which also pointed out my destination. At one point the hiking path crossed the road and I pulled to a stop. According to another sign, the Großer Beerberg was now only 1km away. Still a bit tired from my run the previous day, I thought that 1km is about as much I wanted to do at this time, and I took of with just my camera. The hiking path, a forest road really, led gradually up to a clearing with a view platform which posted a sign "Großer Beerberg" and offered nice views of Suhl and the surrounding area. The whole area was forested, but right infront if the platform, all trees had been cut in order to offer a nicer view to the visitor. Behind the platform, however, the dense trees continued and the slope was also leading further up into the forest. It was therefore obvious that the true highpoint must be a bit higher up in the forest. Wanting to get to the true high point, I went out to search and after about 10 minutes came to a swampy, treeless bog, with a larger stone in the center of it. It took a bit of careful route finding, in oder to reach the stone without getting my feet wet, but eventually I reached it and declared it the summit. No markers were on the stone confirming my assessment, but there was no higher point anywhere I could see and I reasoned that they would not put a marker into the middle of nowhere, if not for good reason. Therefore, I spent a few minutes taking pictures before heading back down. Always amazing the fact that I spent hours (and days) getting close to the mountain and then hours hiking up to the summit, and then after about 3 minutes I have enough to hike back down (for hours) and drive back (for hours or days). Strangely anti-climatic! I got back to the car and back on the road and headed southeast to get to the town of Oberwiesenthal, the nearest town to the Fichtelberg. It was about a three hour drive, even though I stopped once to call Carsten Brauner and agreed to hook up with him in Chemnitz that night, Chemnitz being only about a 45 minute drive from the Fichtelberg. Aso I was approaching Oberwiesenthal, I took some pictures of what I thought to be the Fichtelberg. However, as I parked the car, I realized that it was actually a mountain just south of the border, and thus located in the Czech Republic and called Klínovec or Keilberg. It is at 1244 meters actually the highest point in the Ore Mountains (Erzgebirge). Well, I turned around towards the city of Oberwiesenthal and sure enough, the the north of it, was another mountain, which I had completely missed on my drive in. I could clearly make out the summit tower and the ski slopes and lift leading up to it. I left the car where I had parked it and walked through the city, not sure yet, if I wanted to take the Gondola up (as I was still sore). But I decided against it and eventually found a hiking path, that led in switchbacks passed the ski jump arena, up the col between the two summits. Talking of two summits is really exaggerated as it is really just a big platform with two points that are just a couple dozen meters higher than the rest, but nevertheless, they were highpoints and it had to get to them. After arriving at the col, I turned west to get to the lower summit first. Good decision because it turned out to be the much more interesting one by far. This was due not just to the fact that there was a 25 or so iron summit tower that I head to ascend with an vertical iron latter to enjoy fantastic views of the main summit and Klínovec from the top, but also due to the fact that I was the only one. This latter point was particularly important as I could see masses of people on the other summit. I also learned at this point that a road was leading to the Fichtelberg summit and accordingly, there were plenty of cars and even more load motorcycles going up to and at the summit. Needless to say, I took my time on my tower, enjoying the solitude and relative calm and took plenty of pictures. When I strolled over to the true high point, I had to share the road with cars, always a bad sign at a summit. I therefore spent little time at the summit. I climbed the tower and took pictures and even supported the commercial exploitation of this summit by eating a Bratwurst, but then I quickly paid 5Euros and took the chair lift down. There literally were hundreds of people at the summit, showing of on their bikes or low-rider vehicles. I had to got out of there and did so as quickly as I could. That's the excuse for taking the lift, plus I was tired (did I mention that before?). Back at the car, I quickly drove on into the Czech Republic in order to explore the possibiliy of getting to the top of Klínovec. I turned out to be a fairly easy drive up to the summit chateau. And it really was a chateau, or used to be, a huge building now in a state of hopeless disrepair. Carsten told me later that various attempts at renovation had been undertaken but so far none had lasted. I parked next to 20 or so other visting cars and strolled around the building and the summit area. The most interesting aspect was a couple of radio-operating guys who had both their cars hooked up to gigantic antennas (or so it seemed) and how were loadly eavesdropping on any sort of coherent sound that would interrupt the static. Their radios were turne up to full volume and all present could als witness the fact that there was much more static than acutal contact with any one out there. Weird, and the two guys were just sitting there and not operating their mics or any of the other equipment. Strange, I thought the cold war and eavesdropping on the Western enemies of the "real existing socialism" had been abolished. Hmm, but I never figured out what this was all about, because the summit was disappointing in any other way. I could not even see the Fichtelberg, as it was hidden behind the long plateau and foresty section of the summit. Nice views to the other three directions though. After taking a few shots, I left the summit area and drove to Chemnitz to have dinner with Carsten and Sandra.